Libya Crisis Media Coverage: Who Uses Wikileaks Cables? Before continuing our analysis of the impact of Wikileaks on US Reputation, we include a new post directly related to the analysis of a political crisis of a country and the role of Wikileaks. This post comes after our analysis of the media coverage given to the crisis and revolt in Tunisia and Egypt (plus a country analysis of Pakistan). We do not provide here the same line of analysis followed to study the Egypt and Tunisia case, as the main of this blog is not to provide a systematic analysis of Wikileaks impact, but just to show selected empirical results to interested readers, by using the approach and techniques developed at Media, Reputation and Intangibles center, MRI Universidad de Navarra. The specific topic that we want to analyse in this post is how media from each country is interested in using Wikileaks cables related news about Libya when coverring the Libyan revolution. As explained in precedent posts, we check newspapers appearances from sources all over the world. We can thus cluster the results by country or by international region. We performed this analysis already, showing where did global media interest in Wikileaks cables come from. 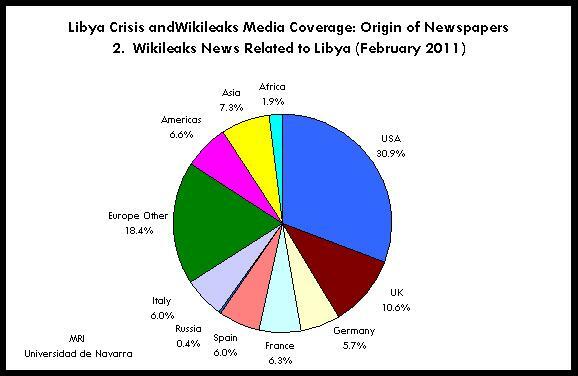 Next figure shows the results concerning the origin of news about Libya using Wikileaks sources. This analysis is made by some 2,700 articles about the Libyan crisis citing Wikileaks. In order to provide additional ground for analysis, we show the origin of all news related to Wikileaks, during the same period of Libya related news. This is all February 2011 period. Comparing the results of both figures, we observe that US media are using Wikileaks cables more profusely when covering the Libya crisis. 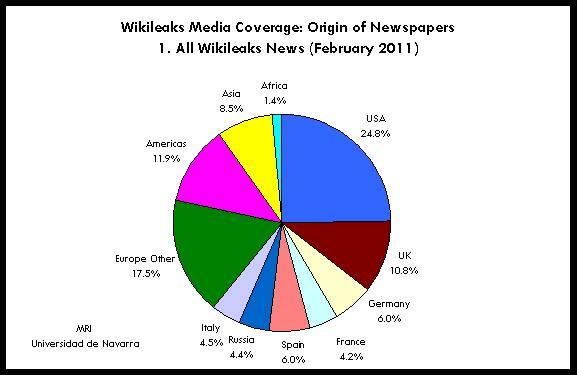 United States newspapers are respsobles for 31% of all Wikileaks news about Libya, while they count just for 24.8% of all news related to Wikileaks in general. We find that also Italy, a country with strong ties with the African country, takes a bigger share of all news related to the Libyan crisis using Wikileaks cables (from 4.5% to 6.0%). France is also another highly sensitive country. Also African countries cover in a higher extent the Libyan revolution using Wikileaks cables (a share of 1.9% against a general share of 1.4%). Asia and the Americas media (Ex USA) play a minor role and interest. That doesn’t change this particular thing.